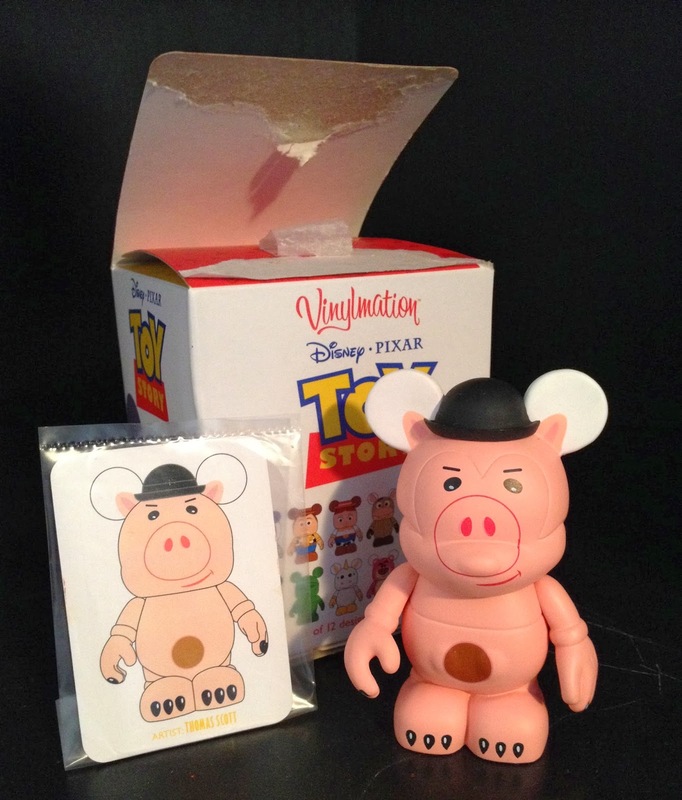 Toy Story: Vinylmation PAGE UPDATE- Evil Dr. Porkchop Chaser! 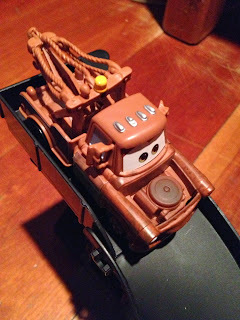 Today's post is a page update to the Toy Story Vinylmation page...visit it HERE (and scroll down a bit) for more on the Dr. Porkchop Chaser! Welcome! 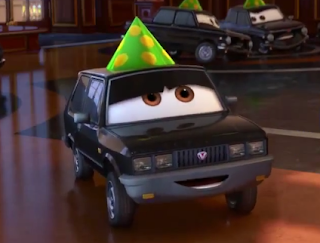 Today's blog post is yet another character from Cars, Kori Turbowitz! As seen in the screen shot above, Kori is the field reporter who covers the Piston Cup Championship for the RSN Network at the beginning of the film (and shows up multiple times later on). Kori is a 1:55 scale diecast from Mattel and was released only one other time- in a "Race O Rama" series movie moments 2-pack with Lightning Mcqueen. Well, today is my last night in CT with my family and tomorrow Brita and I head back to ID. I've had an amazing Christmas break and I'm so grateful for our families! It'll be sad to leave again...but I gotta get back to school! I'll be so happy to be done soon so I can just live back here for good. ANYWAY...Today we have Tex Dinoco, the team owner of Dinoco in the original Cars! Tex is a 1:55 scale diecast car from Mattel. This Tex is a re-release and was available only at Toys R Us as part of their "Radiator Springs Classic" series. 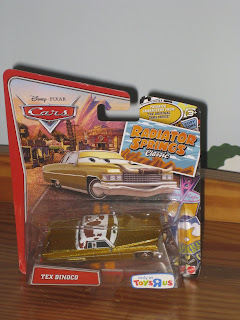 Tex has also been released in the "World of Cars", "Supercharged", "Lenticular Eyes", "Race O Rama", "Color Changers" and this year's 2 pack with Mrs. The King...SO I guess he's been in just about every line so far! Tex is a 1975 Cadillac Coupe De Ville. Tex's license plate reads "DINOCO". The same applies for Dex, his Cars Toons doppelganger. Tex has a similar car body to Mel Dorado, a TV show host in Cars 2. Tex's name is a reference to his home (Texas) and strong Texan dialect. It could also be a reference to THX's mascot of the same name (who Pixar also created). All that stuff is fun but what I really got it for was the highlight of the magazine- the 56 page graphic novel that goes through the film from start to finish with comic book style illustrations. The novel was the main reason why I got I got this magazine (because I was so excited to read the story) but I didn't realize how detailed it would be. I kind of regretted it since, once I saw the movie, I felt like I had already seen it. I'm definitely more careful with spoilers now! This was about 10 bucks and could be found just about anywhere but now, of course, it's out of print. You can usually find one online though through Amazon (sold from third party sellers) or sometimes one will pop up on eBay. They're usually very cheap, so if you're interested, definitely try tracking it down! 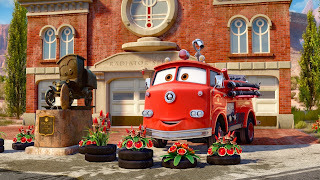 Originally released in the first wave of the Pixar Cars line in 2006 as a "Movie Moment", here we have Red the lovable firetruck and Stanley; the founder of Radiator Springs! This 2-pack was also released in the "Supercharged" and the "World of Cars" lines. 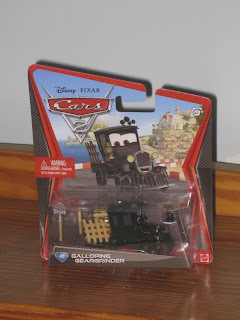 Red on his own (as a Deluxe Oversized) was released again with Cars 2 in 2011, this past year (2012/2013), and again for 2014. There have been many opportunities to get him so don't miss out! Stanley the statue, however, hasn't been released for a while and is a bit harder to find online for a good price. I absolutely love this set. Stanley has awesome detail (and a great paint job) and is an all around vibrant and well made diecast. These cars are Mattel's 1:55 scale in size. 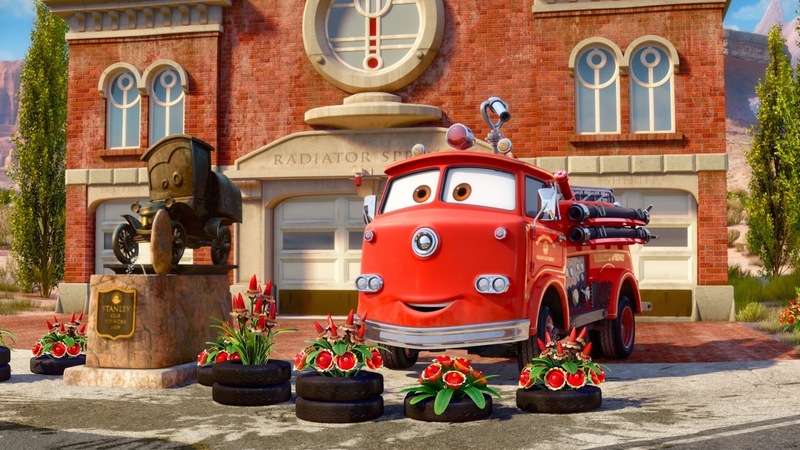 In the Cars films and shorts, Red is often seen watering the plants near the statue of Stanley. Check out how perfect the Stanley statue is with the rest of the Radiator Springs play sets HERE! 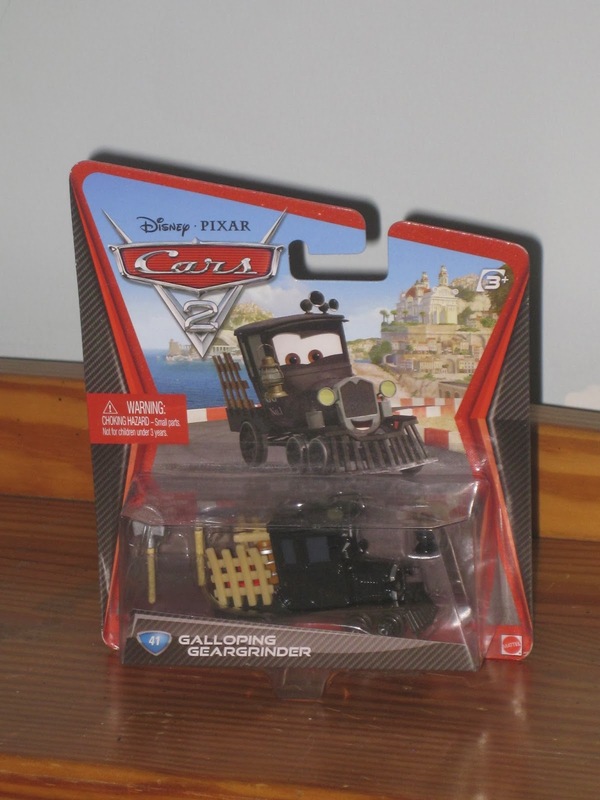 Here is #41 of the Cars 2 Mattel 1:55 scale diecast collection, Galloping Geargrinder! This one for me was a bit hard to finally track down in stores but I was super exited once I finally found it! This car was released late last year. 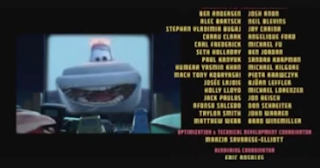 As shown in the screenshot above, Geargrinder can be seen near the beginning of the film when Mater and Mcqueen mistake this old car for an oncoming train. I'm so excited for all the incredible Pixar collectibles I'm getting today (in Maryland with my In-Laws) and tomorrow with my parents! Many fun posts to come in the next few weeks. When I was little, I remember having a few hooded towels and thought they were fun and cozy. 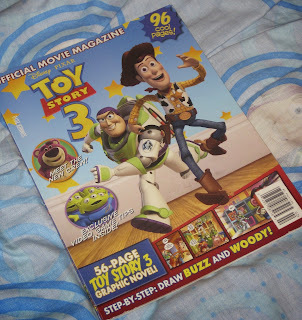 When I saw this Woody one at the store back when Toy Story 3 came out, I couldn't resist it. Not for myself of course, but for my future kids to enjoy. In addition to this one, a Buzz and Jessie hooded towel was also available at the time (but this was the only one I got out of the three). Merry Christmas Eve everyone! I'm with my wife's family in MD this year for Christmas and then will be going home to my family in CT right after. Lots of Pixar on its way! When I arrived to MD to be with my in-laws, they were nice enough (knowing how much I love Pixar) to surprise me with a little fun treat to enjoy before Christmas! Here we have a Cars 2 "Holiday Countdown Calendar" with a chocolate behind each door leading up to Christmas Eve. Hope you all have an amazing, safe and festive Christmas and thanks for taking to time to drop by! Be sure to check back daily for more from my Pixar collection. Appropriate for this snowy and cold time of year, here is my Mattel 1:55 scale Cars Yeti, the Abominable Snowplow! This version I have is the "Look my eyes change" lenticular version but was also available with fixed eyes in the "Supercharged" and "World of Cars" series. 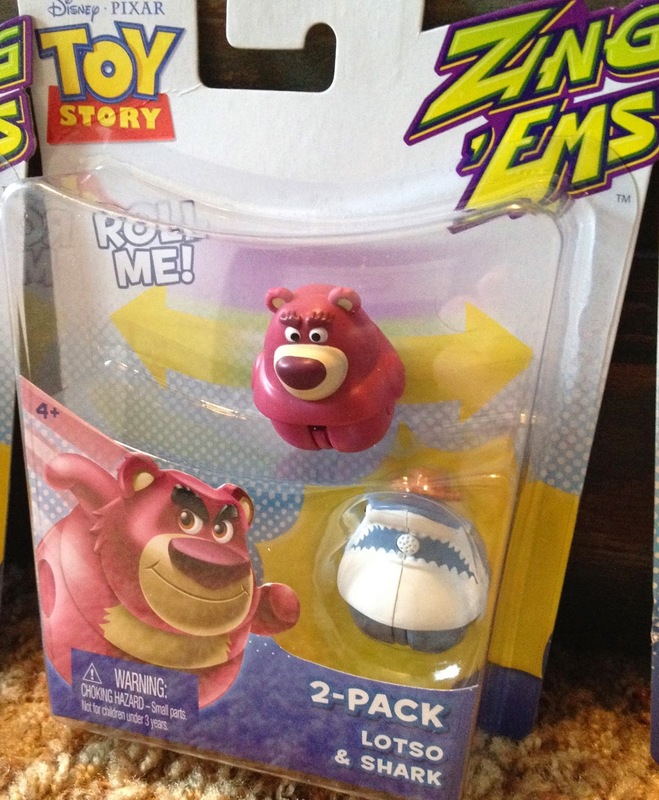 A chase variation of this Yeti is also available (I have yet to get that one) which includes the yellow snowcones! 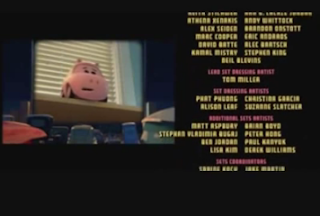 There have been a few other cars also released from this hilarious end credits drive-in scene including Mike, Sulley, Buzz, Woody, Hamm, PT flea, Flik and the above mentioned Yeti with snow cones! I'm super exited for the "circus cars" who will be released as super chase cars in 2014. 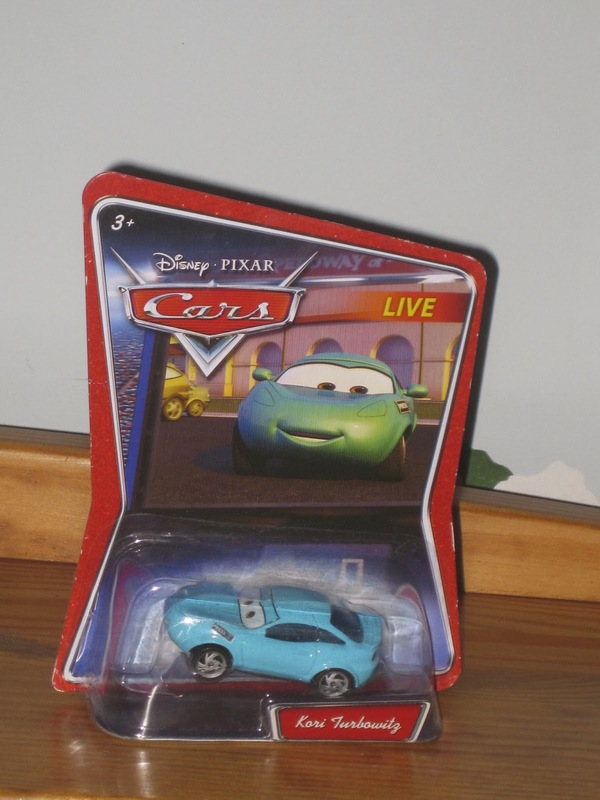 Labels: Cars & Cars 2, Monsters Inc. Here is another fun movie moments Cars 2-Pack, Buzz and Woody from the film's end credits Radiator Springs drive-in scene! This was part of Mattel's 1:55 scale "Supercharged" line from 2006. There have been a few other cars also released from this hilarious scene including Mike, Sulley, Hamm, Yeti, Yeti with snow cones, PT flea and Flik! I'm super excited for the "circus cars" who will be released as super chase cars in 2014. Stay tuned for more right here, soon! Since 1966, kids have loved clicking through and viewing slides/reels that feature some of their favorite characters with the "ViewMaster" toy! I know I had a bunch when I was little. They're classic! 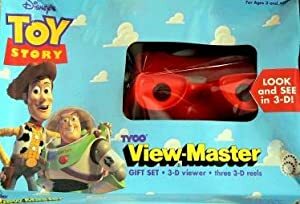 This "giftset" came out right around the release of Toy Story 3 and came with three reels, the ViewMaster itself and the red carry case. The images are 3D and feature many of the most iconic scenes and characters from all three films. I also got a couple sets of extra reels that were available in sets of three. I have nine reels total. 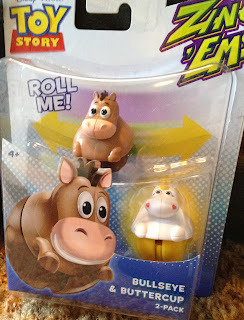 This was definitely not the first release of a Toy Story themed ViewMaster, however. 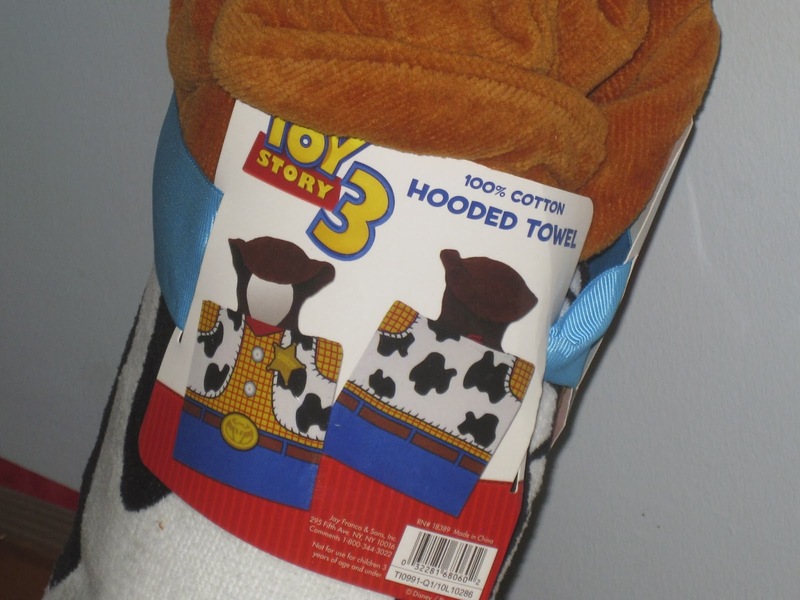 There was the original one in 1995 and a Toy Story 2 specific one in 1999. I don't remember having either of those so I think this was my very first Pixar related ViewMaster. Definitely get this one on eBay or Amazon if you haven't already! 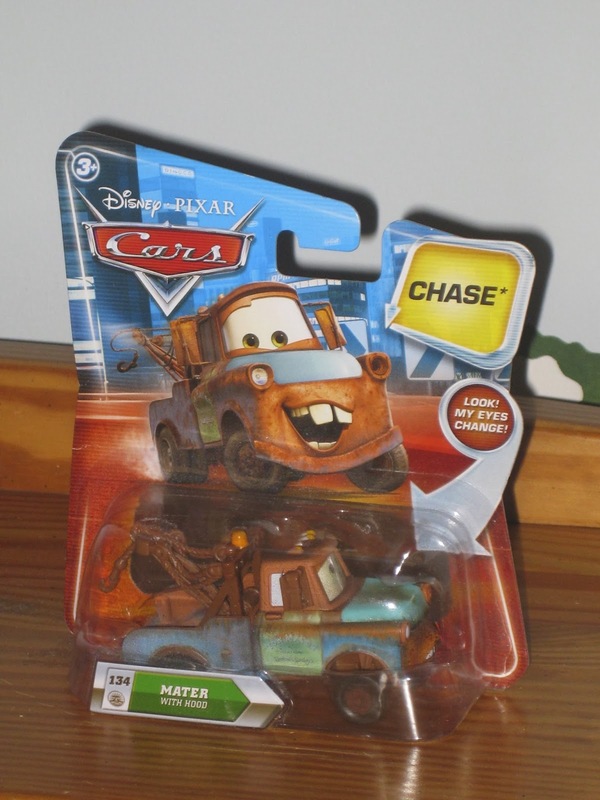 Mater with Hood was only released as a "lenticular" car (which means his eyes change as you move in back and forth) and is number 134 in that series. For a chase car, he's very easy to find. Check out Amazon and you can snag him for about 7 bucks if you were looking! 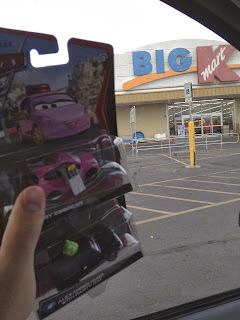 Every year, Kmart has a special "Cars Event Day" in the fall where they have Pixar cars that are exclusive to that day, first available on that day, or just hard to find. 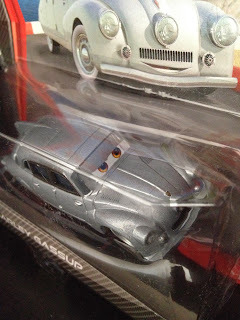 These cars, Alexander Hugo with party hat and Mary Esgocar, were available at the event from last October, 2012. From what I've heard from stories of other Kmart Cars days, they get pretty packed with lots of fans trying to get the latest cars. Typically, there is usually a raffle and, if you get your ticket chosen, you have first dibs opening a brand new case. For me, I live in a small college town currently. My Kmart Cars days are not packed in the slightest. In fact, funny story, when I went to this Cars day to grab these cars, there were more cases to open then there were people there. Two employees stood there by the table with the cases of cars and said "welcome to the cars event" in very monotone voices (it was like straight out of a funny movie). "We are now going to have a raffle to see who gets a case to open all to themselves." They then realized that the only people there were me and a little old lady and, since they had four cases, they scrapped the raffle and just gave us our own cases to open and look through. These were the cars I wanted and I snagged them with ease (along with a free Cars diecast poster they were also giving away). They also had silver edition racers that day but was not interested in those. And there we have it! Cars Day 2012. Good times...If you never knew about these events before, definitely keep tabs on when the 2014 one will be held so you don't miss out! I will, of course, have the info when it arrives next year. 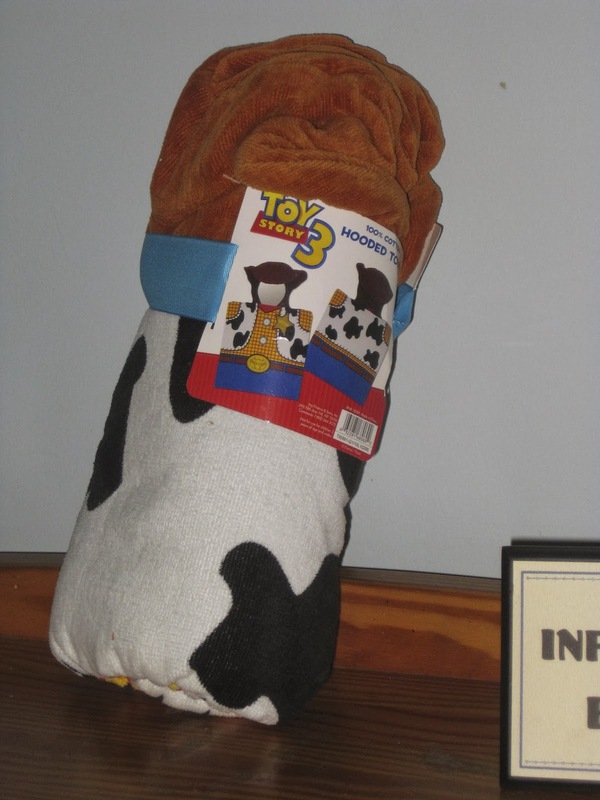 Stay tuned and check back daily for more items from my Pixar collection! If you're a Cars fan, there will be plenty more coming! 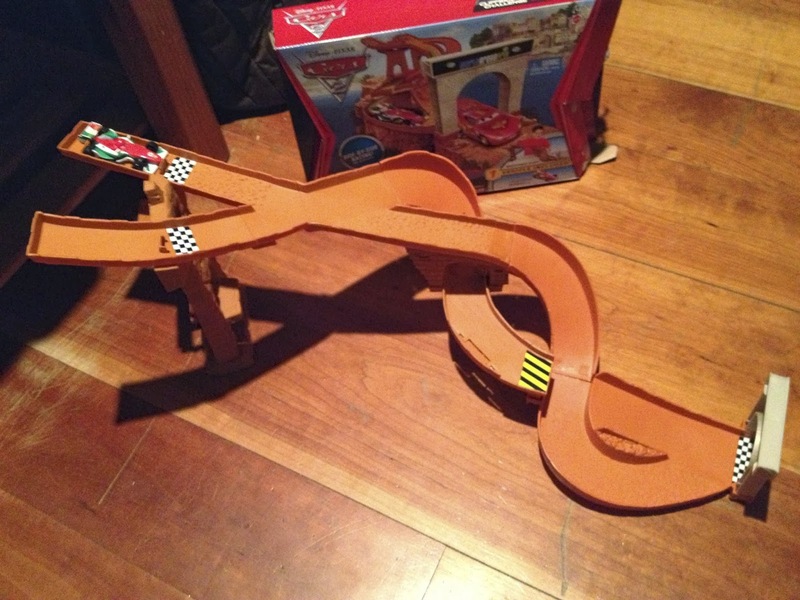 Here is the Mattel Cars 2 1:55 scale "Cliffside Challenge" track set! 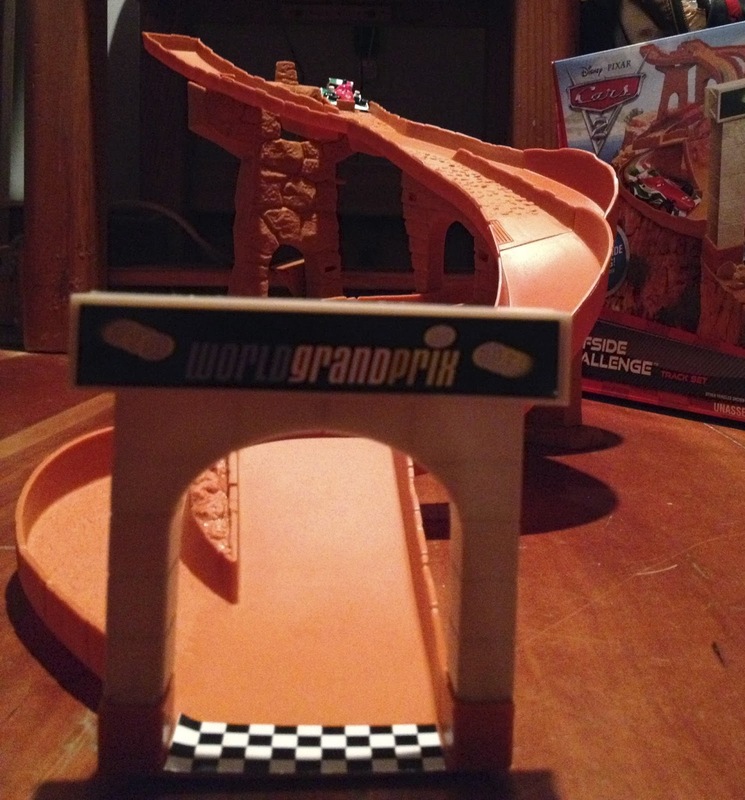 With this, you can recreate the fun and excitement of the Porto Corsa race seen during the Wolrd Grand Prix in the film. Not only that, this is one of six sets that connect to make an awesome chain reaction! The others include Stunt Ramp Getaway, Barrel Blowout, Spy Jet Escape, Tokyo Spinout, and the Big Bentley Breakout. This set comes with one plastic 1:55 scale Francesco car and is meant to be used with the diecast line as well. My only complaint with this set is that it was a little tricky putting it together. The directions had no words, only pictures, and it was hard to tell what track pieces connected together. Anyone else have this problem who am I just really bad at following directions to assemble things? Thanks so much for stopping by and come back daily for for updates from my ever expanding collection of Pixar toys and collectibles! 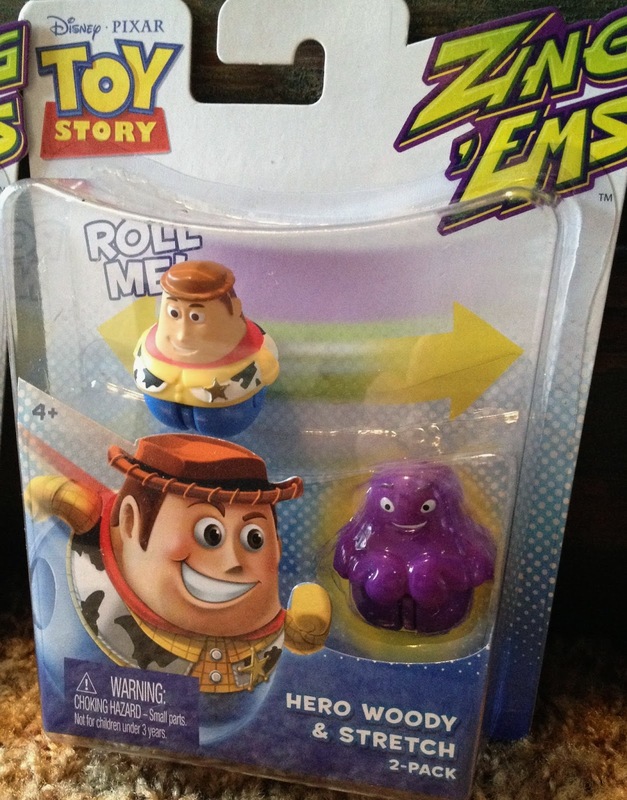 Do you collect Toy Story Buddy Packs? Are you looking for a cool carrying case to store them in? Then look no further! Here is my Buzz Lightyear storage case meant for for buddy figures (fits up to about 30 figures it says, but I haven't tested it since most of mine are still in the packages). 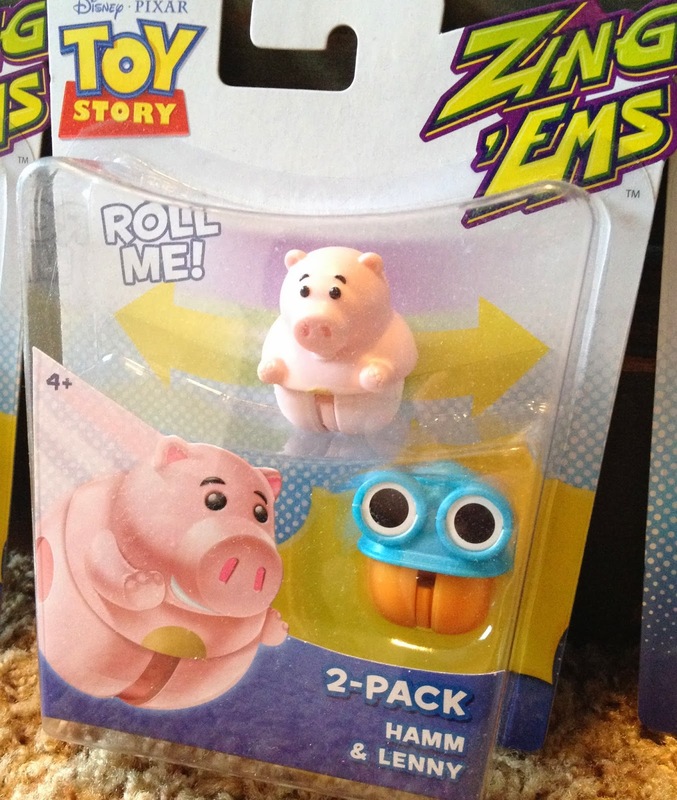 Of course, you can also use it to store any type Toy Story figures that are small enough to fit. This came out around 2010 but you can still find it online for under $20. On Amazon, however, it's quite expensive with almost a $50 price tag. 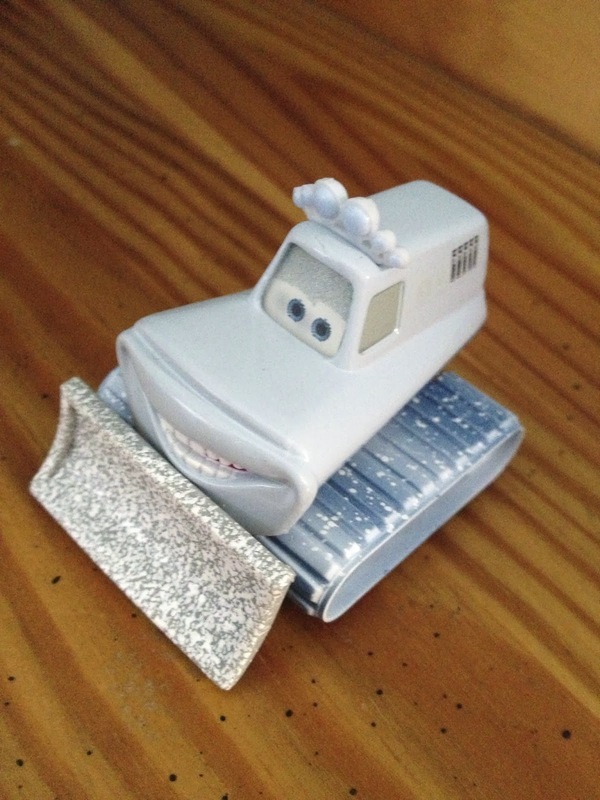 Check back daily to see more items from my Pixar collection. Thanks so much for stopping by! 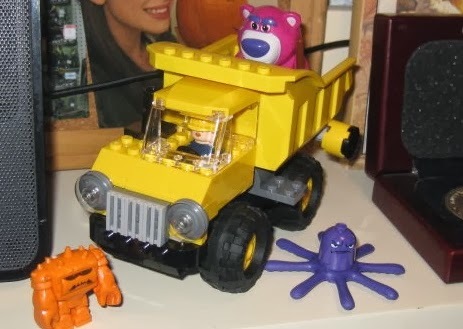 Here is one of the few Toy Story 3 Lego sets I got back when the film was released in 2010...Lotso's Dump Truck! 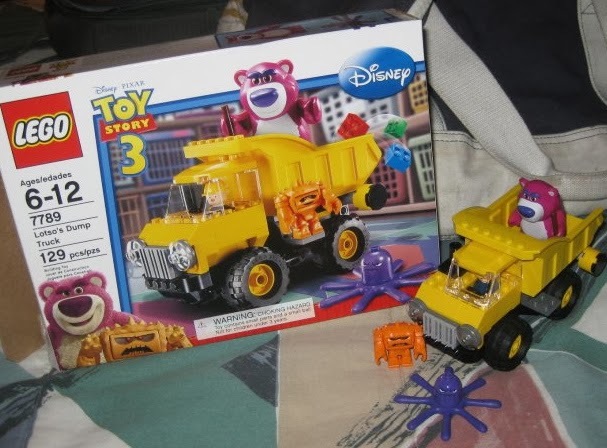 It's 129 pieces and comes with Lotso, Stretch, Chunk and truck driver mini figures. For more of my Pixar related Lego sets, check out the Lego label to the right. The last few sets out there I'd still like to get are the Pizza Planet Truck, Woody's Roundup, Western Train Chase, Trash Compactor Escape and the Garbage Truck Getaway. Thanks for visiting today's post and be sure to come back daily for more updates from my Pixar collection! 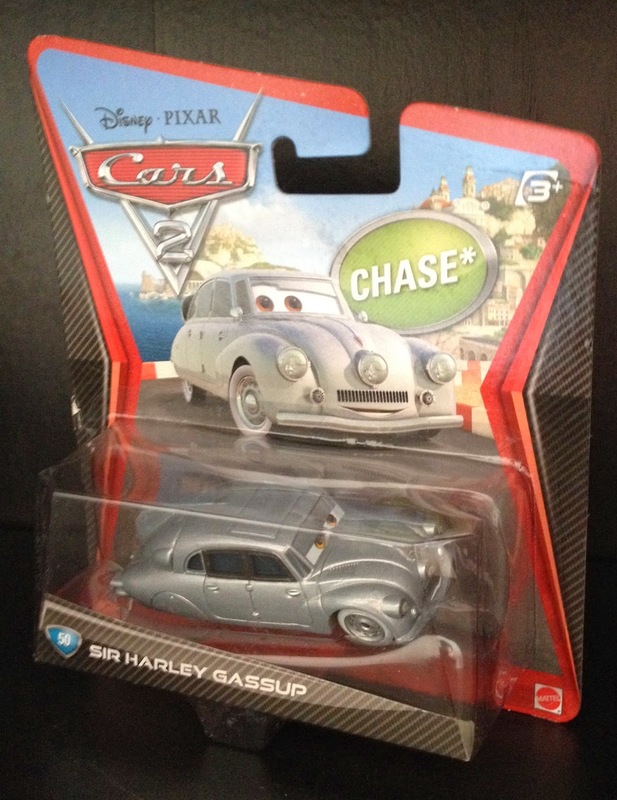 My original 2011/2012 Cars 2 diecast collection is finally complete with the addition of the "Chase" Sir Harley Gassup, the Lord Steward who appears in the film along side the Queen at the London race and Mater's knighting! I was never able to track this down at stores when it was first released and has sold only for higher prices online since. He seemed to have a distribution that felt more like a "Super Chase" car rather than just a regular "Chase." I was SO excited yesterday when my wife Brita surprised me with a mystery Amazon package and wanted to give it to me as a little "just because" present! I had no idea what it was and was so surprised when I opened it up. This car was a long time coming! That was extremely loving of Brita and I can't thank her enough. Harley is a Tatra 87, a Czechoslovak car. Concept art shows the Tatra 87 was first envisaged to be a member of the Lemons group. 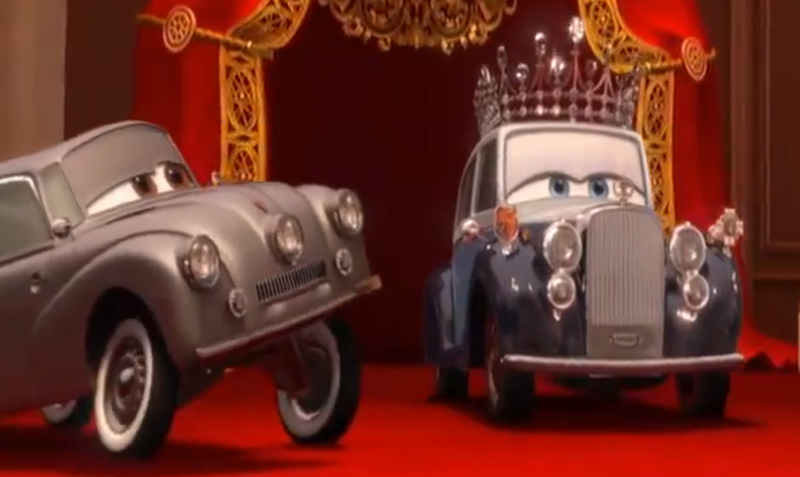 His one line in the film is : "Your Majesty, may I present for the investiture of honorary knighthood of the British Realm, Tow Mater of Radiator Springs! "—Sir Harley Gassup announcing Mater. 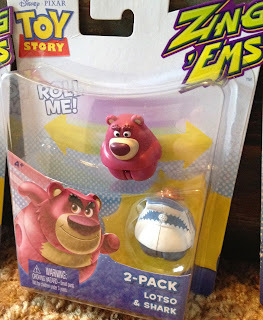 A few weeks ago I was super excited to find an unexpected wave 2 of the Toy Story Zing Ems at Target! 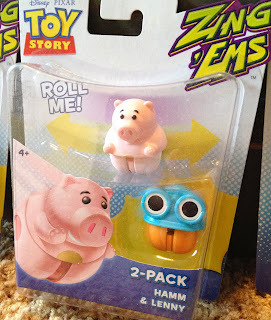 I had no idea these were even being released and there they were. Since then, I have searched eBay, Amazon and Google Images (just out of curiosity) and I can't even find a single picture of these new ones. They're kind of unknown right now which made me even more excited. 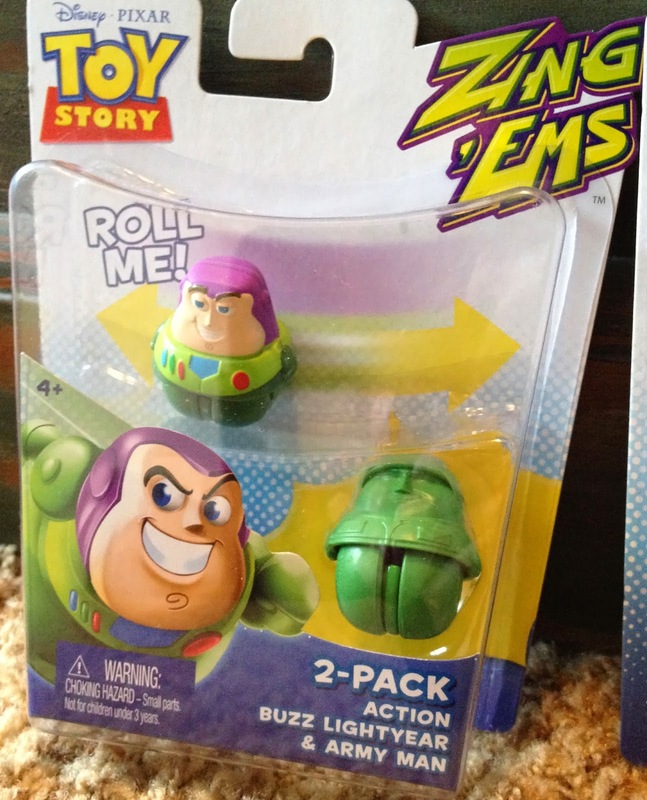 Action Buzz Lightyear (different from the wave 1 Buzz. This one has a green bottom and a different facial expression) and an Army Man! Lotso and Shark (with Woody's Hat)! Hero Woody (different facial expression from the "Sheriff Woody" in wave 1) and Stretch! If you look close to Stretch, you can see she has a cool glitter paint job. If you collect these, keep an eye out for them. Maybe these were released early at my store by accident and that's why I can't find them anywhere online. It's a mystery! Either way, they should be widely available pretty soon I imagine. Thanks so much for visiting the blog today and check back daily for updates from my Pixar collection! Here is the Mattel Cars 2 Spy Jet Escape track set! 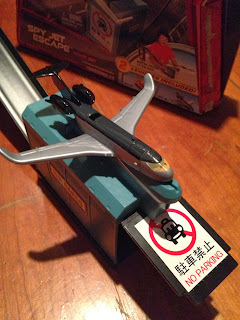 Here you can recreate the exiting Japanese Airport escape scene from the film. This is one of 5 other track sets that connect to make an awesome chain reaction! The others include Stunt Ramp Getaway, Barrel Blowout, Tokyo Spinout, Cliffside Challenge and the Big Bentley Breakout. Look for more posts on these track sets soon! This set comes with one 1:55 scale plastic Mater and a small launching plastic Siddeley the Spy Jet. It works with diecast cars as well.